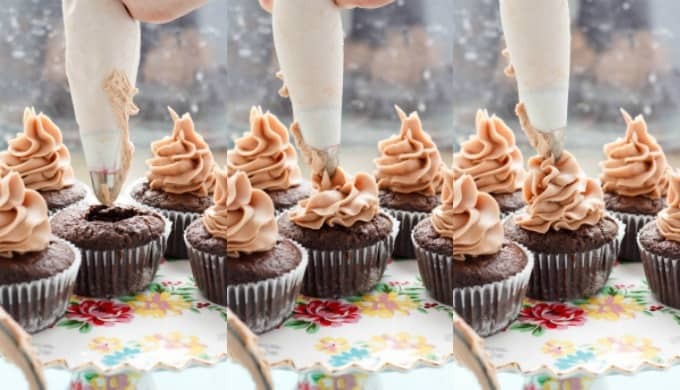 So silky and smooth, with a little hidden surprise inside, these lindor milk chocolate cupcakes with chocolate buttercream are definitely my most popular cupcake recipe! 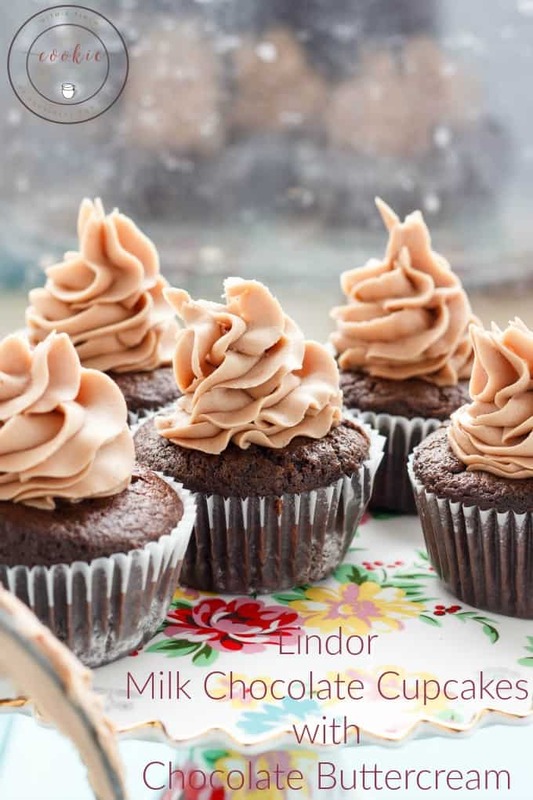 The photos and recipe for these lindor milk chocolate cupcakes with chocolate buttercream have been updated as of April 26th, 2016! Have I created something dangerous. I mean really, really dangerous. You know how your head starts turning when you have some extra ingredients or food hanging around, and you want to use them up? Yeah, I accomplished that today, and probably put on 20 lbs. 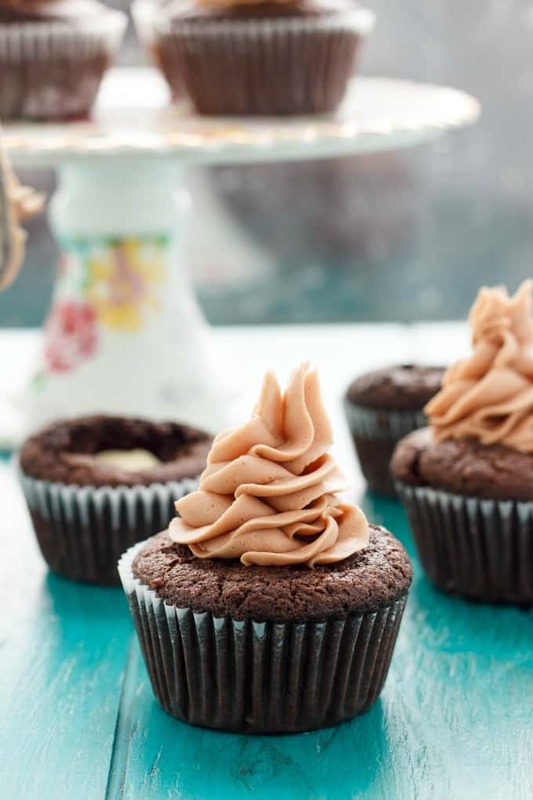 These Lindor milk chocolate cupcakes with chocolate buttercream are soooooooooo good. I am serious; probably my favourite chocolate creation ever. There is no going wrong with Lindt chocolate. Even someone like my brother, who is not a chocolate fan, loves Lindt’s Lindor Milk Chocolate (I am not endorsed by Lindt at all, just stating a fact!) They are so soft, and creamy, and plain delicious! My mother-in-law always buys me the huge box of assorted flavours from Costco each Christmas and I tend to devour the box in no time. However, I do have my favourites. The milk chocolate and hazelnut flavours get eaten first, and I usually give my daughter the dark chocolate. Surprisingly, the white chocolate is always left. I have nothing against white chocolate; it may have to do when I was a child and my mother believed I was allergic to chocolate. That year I only received white chocolate for Easter (while my brother and sister got the good stuff!) All the flavours are delicious, I just have my personal favourites. Since Valentine’s Day is the next major celebration approaching us in the food blogging industry (though, football season is upon us, but we are not sports fans here,) I thought I would get a head start and use up these last remaining chocolate truffles. 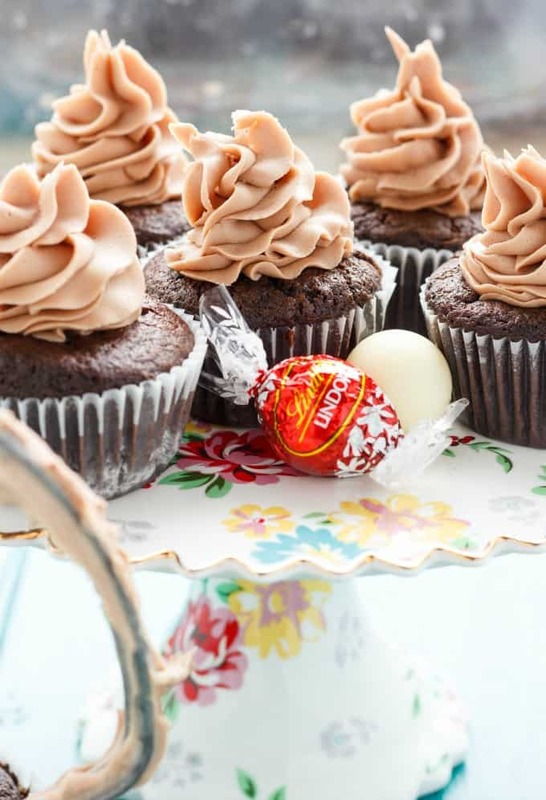 The idea for the Lindor milk chocolate cupcakes with chocolate buttercream hit me one night while I was in bed. Yes, I go to bed thinking about food and wake up thinking about it. I knew the small balls would fit perfectly into cupcakes, but I did not want to bake them directly into the batter because the Lindt Lindor Chocolate is usually very soft. Literally you bite into the hard shell, and the inner chocolate is melt-in-your-mouth deliciousness! So I did the next best thing; I placed the unwrapped chocolate directly into the cupcakes as soon as I removed them from the oven. Result? A soft melting of the chocolate, without losing it everywhere! Ahhhh! I am still drooling! Pretty sure I would remarry my husband if he presented these to me on Valentine’s Day! Now, one snag I hit along the way was getting the icing on top of the cupcake, even after the cupcakes had cooled. See, I wanted to do that cool blob technique because I already knew the cupcakes would be rich. I figured less was more when it came to the buttercream. Except, when I went to begin the blob right above the exposed soft chocolate, it instantly pushed into the Lindor chocolate, causing the filling to run everywhere. I tried chilling the cupcakes in the refrigerator to get the chocolate filling to firm up more, and that seemed to help, but the technique I wanted to use was still not working. UPDATE: No issues this time around. I just made sure to push the truffles further into the cupcake this time 🙂 In the end I went with the classic 1M swirl technique, making sure to drop the buttercream onto the cupcakes gently and not make the swirl too large. I was super happy with the result, even if I had to change my game plan. I had also wanted to make pink candy melt hearts as toppers, but my candy melts would not melt! I think they must have gone bad because I have never had this much trouble before. 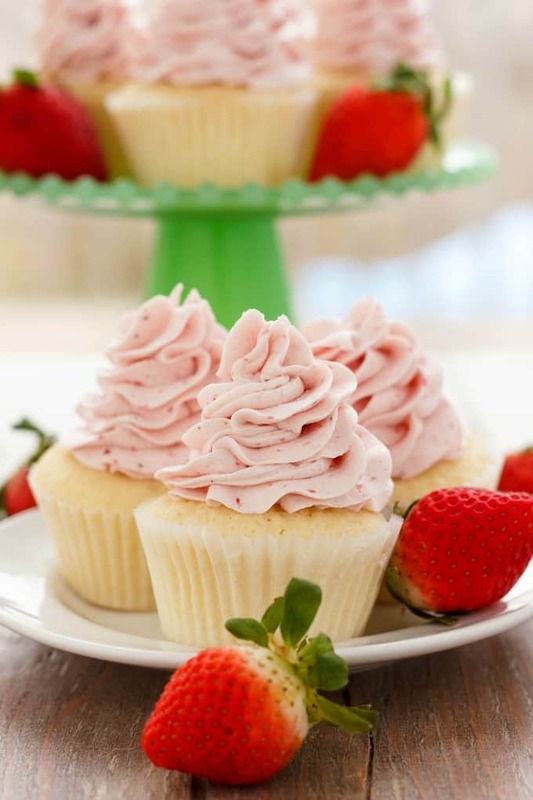 So soft and silky, these cupcakes will blow your mind! In the bowl of your stand mixer, add in the coconut oil and sugars. Beat until well combined, about 5 minutes. Beat in egg until fully combined. Add in vanilla and stir. Pour into muffin tin, about 1/4 inch from top. Bake for 18-20 minutes, or until toothpick comes out clean. 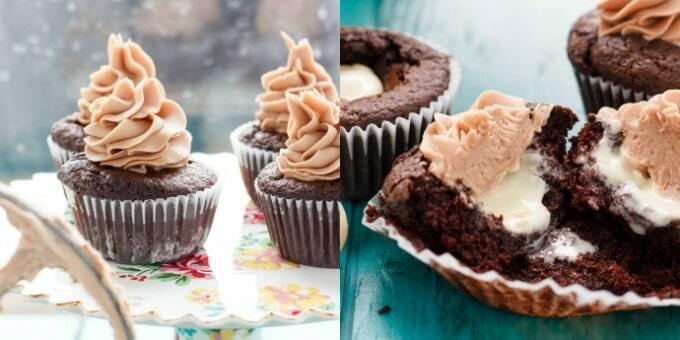 Immediately press a Lindor chocolate into each cupcake. Cool for about 5 minutes in the tin and then move your cupcakes to a cooling rack. Allow to cool completely before decorating. Break the chocolate into small pieces and place into a microwavable safe bowl. Heat in 30 second intervals until the chocolate is nice and smooth, You can also use a double boiler method instead. Allow to cool slightly. Add the butter to the bowl of your stand mixer. Whip the butter until light and fluffy, about 5 minutes. Add in chocolate and mix until combined. Pour in the sugar, whipping cream, cocoa powder, and Kahlua. Keep whipping until fluffy. Pipe onto cupcakes and serve! I was worried the chocolate buttercream would be on the soft side since I decided to use pure butter and melted chocolate. Usually I use cocoa powder. Since we are looking at temperatures between -20 and -25 degrees Celsius these days, I was not concerned at all about these cupcakes drooping on the way into Dan’s work. I did not want to mask the Lindt chocolate flavour in the buttercream but found it needed a touch more chocolate, so that is why I added just a touch of cocoa powder. Helps to get rid of that overly sweet icing taste. I just realized as I type this that I took no pictures of the actual inside of these Lindor milk chocolate cupcakes with chocolate buttercream! What was I thinking?! The whole point was to show off the awesome milk chocolate filling! I was obviously too busy eating these cupcakes to remember such an important feature. I guess that is an excuse to make them again?! Plus, I did technically create these for Valentine’s Day, so I could always recreate them on February 14th… Or a gluten-free recipe… UPDATE: I made sure to get a picture of the inside of the cupcake this time around! Lindor truffles are my very favorites chocolates and these look amazing!! They were so full of Lindor flavour! I was a little upset I only saved one for myself. I have no words for how amazing these look. Mmmm. This is flippin' genius! Lindt truffles are my favorite candy ever! Pinning! OH MY GOODNESS!! This is one brilliant idea! I have some lindt truffles in my pantry right now! I am starting to think everyone has these bad boys around! such a great idea! I can just imagine the melty truffle in the middle of the cupcake, love how you tied together the flavors of the cupcake and frosting. Yum! Oh maaaaaan, I think you made the most perfect cupcake ever! Thank you so much! I would like to think I created something delicious and totally dangerous! You don't lose that melt-in-your-mouth soft chocolate core that Lindor is famous for! These look so amazing!! Like, how can you take an awesome cupcake and make it 100 times awesomer? You just cracked the code. I feel like this is where I should admit to eating the bag of Lindor truffles I received for Christmas and the bag my husband received. Although he doesn't yet know that. Oops! I must get more to make these amazing cupcakes! Pinned! Looks amazing! Would it be possible to make one large cake instead of cupcakes with this recipe? Love Lindor! For sure! Instead of stuffing the cake you could probably layer the chocolate truffles around the top of the cake with a chocolate ganache :) I have been meaning to make one for a while! My chocolate cake tutorial should help out here. Thank you for the post, something to do with the grandkids. You are very welcome :) They will love them! After these cooled, was the trufffle hard? What if they are refrigerated and then brought to room temp the next day, hard center?